Hey girl hey! Having a beauty blog has been one of the most rewarding things for me. I get to talk about something that I have studied and done professionally for years, while also connecting with people to help solve their issues. It’s so much fun to be able to find a holy grail product for a reader or follower, and see that they feel confident enough to be able to use it. In today’s post, I am going to be giving you all my best beauty blogging tips. These tips will cover photography, blogging, engaging, social media, EVERYTHING! If you want to learn the tips and tricks that other beauty bloggers don’t share, keep on scrolling! Some beauty bloggers can get away with only doing natural light. In Indiana, it’s not exactly sunny for about six months out of the year. Because of this, I have a ring light. You don’t need a fancy camera, but nice lighting is key. I personally have this ring light & I am obsessed! It has two settings, one for more yellow light and one for more white light. I use only the white light, as I love more cool toned/bright pictures. If you aren’t convinced that you need artificial lighting, check out the difference below! Obviously this isn’t the most perfect flatlay, BUT it does stress the importance of how great lighting can really produce great pictures. In this flatlay, I chose to use fake flowers and a magazine cut out to make the picture pop! To keep going with the flatlay theme, I love using my fuzzy white rug for flatlays. This one is similar to the one I have. But there are so many different types you can use! I love to use a white poster board, and also a poster board wrapped in marble contact paper. You can get some marble contact paper here! I’ve seen some bloggers use scrapbook paper, bed sheets, mirrors, and so many other backgrounds. You can stick with one or try a bunch of different ones as well. Seriously though. You can still document your collection with the products you already own! Although it is fun to get new products, it doesn’t need to be a weekly or monthly thing. Blog about the products you’ve hit pan on, or products you’ve used up. 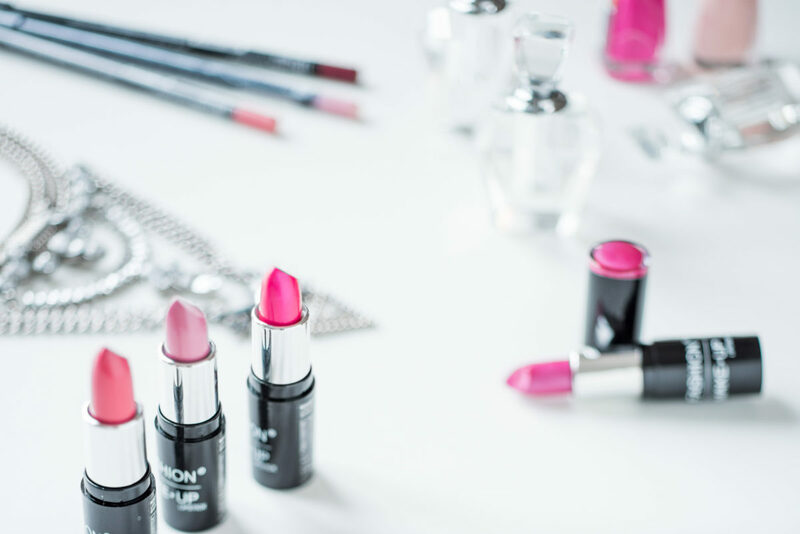 You can still be a beauty blogger without buying makeup all the time! To go off of this, check your local TJ Maxx and Marshall’s for steals on high end beauty! This is something I’m trying my best to do! Try to get pictures when you first receive the product so that it looks more aesthetically pleasing, especially if it’s a palette or something that you can tell has been used after first application. You can always batch shoot content, or take a bunch of pictures with different products, backgrounds and props. This will make the product look flawless in pictures. I can always point out the bloggers who do this, and it really does make a huge difference! Personally, when I work with brands, I let them know that I don’t use a product once and then immediately recommend it to my followers. It’s important to get a feel for the product and find various ways to use it. Allow yourself ample amount of time to get to know the product, and make sure that it’s something that truly works for your skin or your preferences. This is especially important with skincare, as it takes your skin about 4-6 weeks to truly react to product. I love the Estee Lauder Double Wear Foundation because it gives you the fullest coverage that stays on all day long. No matter what your skin type is, it looks flawless on the skin & will keep you looking poreless all day long. This is a must have if you feel like your foundation comes off throughout the day! I’m sure for most of you, this is a “duh” moment. But engaging and commenting on other beauty bloggers’ posts is vital to grow your own beauty blog. I like to leave long, meaningful comments on their flatlays about products that they posted. Then, I’ll occasionally go through the people who commented on their pictures to check out their pages. It is the best surefire way to gain followers and gain blog views. I gained over 300 followers in less than 2 weeks from this method, and my blog views went up as well! 9. Pinterest is your friend! I absolutely love sharing my blog posts on Pinterest. I recently took a course from Ell Duclos all about Pinterest marketing, and it seriously helped bring in so many blog views! You can click here to purchase the course. I’ve learned SO much about how to bring in blog views, as well as how to market myself as a blogger from her course. Every blogger NEEDS to take this course if they want to monetize and be successful. Did you receive a product that didn’t work for you? Talk about it! But not in the way that you think you should. Talk about why it didn’t work for you. Talk about the negatives, but add a positive spin. For example, if there was a foundation you tried that made you feel super greasy, you could say: “I tried this foundation, and it didn’t work on my oily skin. However, if you have dry skin, this would be a great option for you!” Not only is this letting your oily skinned followers to steer clear, its helping your dry skinned followers to find a potential new fave. Those are my 10 best tips for beauty bloggers! Fellow beauty bloggers: What are some of your favorite tips? How do you keep your beauty blog up and running? Let me know in the comments below! Be sure to follow me on Instagram @mallyelizabethblog for more reviews + product recommendations! I have so much to learn about make up and really love all of your tips. These are great tips for every blogger! Your flatlays look beautiful! Awww thank you my friend! Love this post! So helpful and can totally relate! Lol I struggle to take pictures of products as soon as I get them! Haha yes it is a struggle for sure! Thank you for this!! As a blogger just starting out, I am loving all the tips I can get! I am for sure going to check out the Pinterest course. I don’t utilize it as I should. Great read! I can’t say enough good about the Pinterest course! It has helped with my blog soooo much! These are such good tips, Mally! I have done freelance makeup off and on for years while working and going to school and even though I just do it on occasion now for friends and family, beauty is a topic that is so near and dear to my heart. I find myself sneaking it in with my fashion content because I just can’t help myself. These tips are so fabulous! Yes! These are such great tips! I desparately need a ring light! We recently built a house on 5 wooded acres and it’s a bit darker than our previous home! Yesss ring lights are a must have! My house is pretty dark too, so I can’t live without mine! I have had that ring light in my cart for a long time. I got an Amazon gift card for my birthday, it think it is about time I pull the trigger on that bad boy. Yessss girl! You will be so glad you did! It’s been the best investment for my blog! Loved this post! Some great tips. Especially taking pictures of products right when you get them! I am notorious for dirtying my makeup and then they look so ugly to photograph! Ooh girl! I really love these tips! I like to mix up beauty and fashion on my IG/blog, but I’ve never thought much of doing flatlays or anything. Definitely subscribing and following along with you! All those tips are so great! I love your advice about engaging with other beauty bloggers, shooting products when you first get them, and now I really want a ring light for any beauty posts I do! Thank you so much for stopping by! You definitely need a ring light girl! You would love it!